According to surveys of comparable curricula at four-year colleges and universities, AP Italian Language and Culture is comparable to fourth semester (or the equivalent) college/university courses in Italian. The three modes of communication (interpersonal, interpretive and presentational) defined in the Standards for Foreign Language Learning: Preparing for the 21st Century are foundational to the AP Italian Language and Culture course; the six learning objectives of the course are built on them. The course takes a holistic approach to language proficiency and recognizes the complex interrelatedness of comprehension and comprehensibility, vocabulary usage, language control, communication strategies and cultural awareness. It strives to promote both fluency and accuracy. Students learn language structures in context and use them to convey meaning. 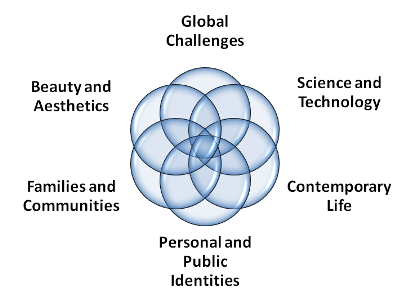 The course is designed around six required themes (global challenges, science and technology, contemporary life, personal and public identities, families and communities, beauty and aesthetics) to provide meaningful contexts through which to explore a variety of language concepts. The themes may be explored independently or may overlap during instruction. Within each theme there are several suggested contexts to help focus exploration. Student inquiry and curiosity are sparked through overarching essential questions to motivate learning and to engage students in real-life problem-solving tasks. In order to best facilitate the study of language and culture, the course is taught in Italian.